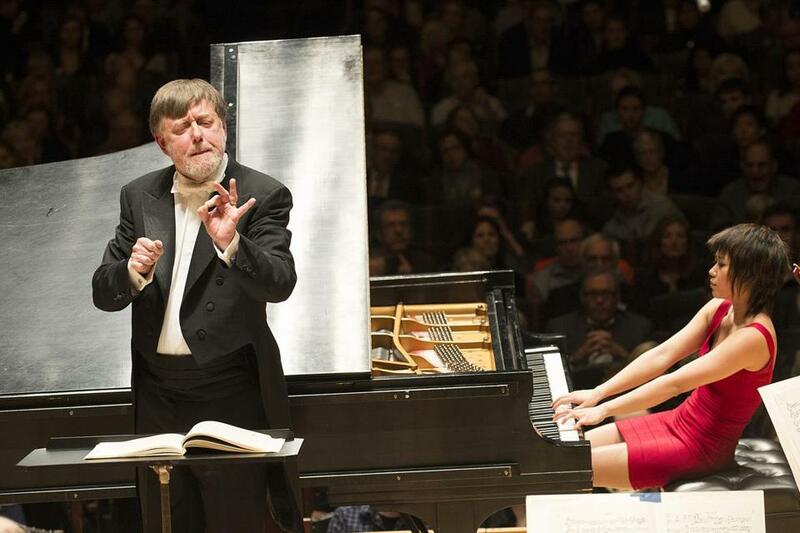 Sir Andrew Davis leads pianist Yuja Wang and the BSO on Prokofiev’s Second Piano Concerto. One of the cherished paradoxes of symphonic music is of course its ability to communicate both deeply and abstractly. Meanings can be at once profound and multiple. Some of the 20th century’s most prolific symphonists turned this to their advantage through a play of revelation and concealment. That is, works in a resolutely public genre derived weight in part from the perceived presence of veiled private truths. Vaughan Williams’s Symphony No. 6 of 1948, which is being performed this week by the BSO, is just such a work, one whose urgency of expression tends to light up our semantic search beams. We sense that music of such violence and bleakness must surely be about something. Many have heard in the unalloyed nihilism of its final movement a statement on the ravages of the Second World War, but the composer himself by and large refused to tip his hand. This week the British conductor Sir Andrew Davis is back on the podium at Symphony Hall, and on Thursday he led a forcefully articulated performance of this muscular score. Those who know Vaughan Williams only in his lyric pastoral vein may be surprised by the vehement tone of the Sixth from its very opening bars. In the second movement a simple repeated march-like rhythm riots over the entire orchestra. The English horn (on Thursday, an eloquent Robert Sheena) offers a consoling voice, but it is brushed aside by a pointedly sardonic Intermezzo. The closing Epilogue is a remarkable 11 minutes of pianissimo, a kind of ghostly counterpoint played out against a moonless sky. The BSO strings quieted their vibrato and at the end the music drifted off into silence with a chilling effect. Someone in the hall tried to clap, but then thought better of it. The mood shifted dramatically after intermission with the appearance of the young Chinese pianist Yuja Wang, who athletically tackled Prokofiev’s formidable Second Piano Concerto. This is a strange and brilliant work, first drafted in Prokofiev’s student days, full of brashness and audacity alongside glimpses of the more mature composer he would become. Wang’s performance on Thursday was a marvel of steely technique pushed to the very edge, and she had a deft way of projecting rhythmic impetus from within Prokofiev’s fiercely knotted passagework. But less well realized in this account were the music’s more visionary aspects, the concerto’s wit and its startling variety of colors. Davis and the orchestra accompanied her gamely, though the occasional balance issue cropped up. In a way the evening’s typical order was inverted, as it began with the symphony and ended where it might have otherwise begun, with Rimsky-Korsakov’s “Capriccio Espagnol,” an orchestral showpiece here buoyantly dispatched. Presumably this was done in order to avoid concluding with the darkness of the Vaughan Williams finale, though I couldn’t help but wonder how that work’s power might have only been amplified by giving it the last word.